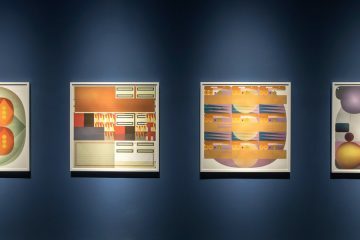 Art concepts and techniques should always be avant-garde, and serve as an approach to men’s comprehension as well as an anticipation of what they will be and how they will behave. 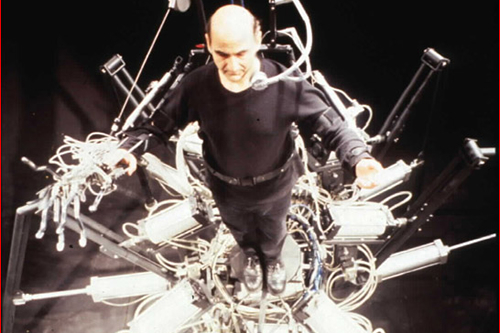 In light of that assumption, Stelarc, who is a pioneer of extreme performances and of performances helped by interactive robotic systems and virtual reality, represents without a doubt an important reference point for all those who want to deal with an artistic project which uses technology as a means of expression. And for the digital native artists he is a role model not only because of his coherence when he carries out researches on the body using all the means of post-modern age, but also because he has managed to leave fully and predictably an evergreen reflection on man’s evolutionary process, even if it is limited in the environmental complexity, through his extension with technological prostheses. Stelarc is an Australian artist, he’s now sixty-three, and he’s responsible for the performing arts at the Brunel University West London, and he was appointed full professo of Art and robotics at the prestige Carnegie Mellon University in America. He started his career in the 70s with a series of performances based on suspension, where he exhibited with his naked body hanging from braces with a number of hooks knocked into his skin. His research on the body, which had been oriented to the demonstration of its obsolescence and emptiness, turned to the use of prostheses, of robotics, of the internet, of virtual reality, of intelligence and biotechnology to state the extension of the body through technology as a requisite for its evolution. Stelarc has investigated the idea of the body with some projects: The third hand, the third robotic arm, Ping body, a performance in which the stimuli generated an arm determine the involuntary movement of the body, Exoskeleton, a robotic system with six limbs controlled by the body of the artist, The stomach sculpture, a 15mmX50mm capsule inserted into the stomach of the artist, Blender, an installation regenerating Stelarc and Nina Sellars’s organic matter, The ear on arm the prosthesis of a ear permanently placed in Stelarc’s arm and connected to a system of bluetooth transmitter. From 23th to 26th October, Stelarc was a guest in two events Tec Art Eco, a three years project sponsored by the associations Ariella Vidach – AiEP (Milan) and Avventure in Elicottero Prodotti (Lugano), which proposes a series of interdisciplinary festivals, productive laboratories, workshops and meetings with international artists on topics as art, technology and environmental sustainability. 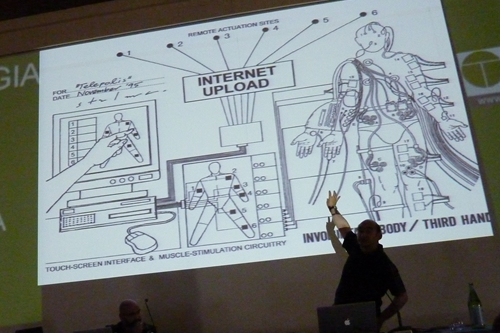 In the context of this new project, a large group of young artists interested on the study of the connection between art and technology could exchange views with Stelarc’s body in towns where you could never expect to have the opportunity to listen live to a pioneer of the interactive art, and these cities are Lugano and Gallarate. In the first event , Extrabodies: beauty remixed , held at Palazzo dei congressi in Lugano, Stelarc exchanged his views in a great meeting with another artist of mechatronics performance, as well as founder of Fura Dels Baus, Marcel-lí Antúnez Roca. 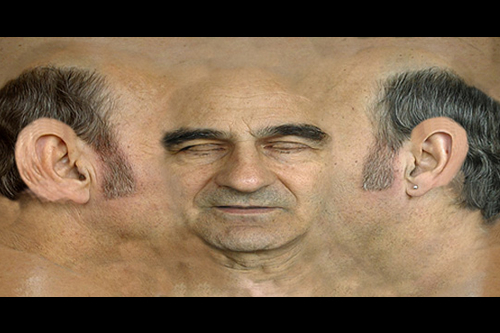 In the second, Redesigning the body / Obsolete bodies Stelarc offered his physical presence for a workshop at the GAM in Gallarate and the virtual presence for Avatars have no organs, a performance of about 15 minutes exhibited in the gallery The Virtual Stelarc initiatives in Second Life, show the versatility of his research in relation to the technological media. We decided not to write a classical article on Stelarc, and as well retrace with him all his rich artistic path: Stelarc is a such well-known artist that many of his interviews and reflections on the relationship between art and sciance can be found on the web. We wanted to know the man behind the artist, think about the topicality of his art and of his research, and for this reason we wanted to report Stelarc’s answers to the questions that some young artists, scholars who were invited and who took part to the event Tec Art Eco (Marco Mancuso, Pierluigi Capucci, Mariagrazia Mattei among others) and I made. Serena Cangiano: If we analize your artistic career, the first curious thing that comes on our mind is the passage from the suspension performances to the high technological ones. 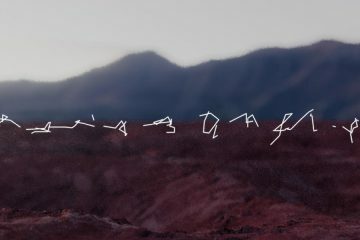 What drove you to point your research and experiences from the naked body exposed to natural forces to the experience with complex technological systems? Serena Cangiano: How do you deal with the aesthetics in your work? Stelarc: Undeniably if you look at the objects The third hand or The extended arm in a sense we shared a similar aesthetics with technology we wanted to use. We used the same materials and we didn’t want to hide the technology. There is a kind of aesthetics but this aesthetics comes from the performance and the construction of the technology rather than begin with a certain aesthetics that pushes you to try to fit stylistically everything into that. So, for example, the aesthetics of the suspension performances were generated from the action of doing the suspension. Sometimes, the aesthetics were just a framing of the image like the rock suspension with one image you could capture the all performance. But, for example, in the remote controlled suspension, where the body is moving, it’s more this choreography of the body that is the documentation of the body becomes the aesthetics. Of course, the stretched skin is part of the suspension aesthetics of a body not in zero gravity but of a body with a weight. 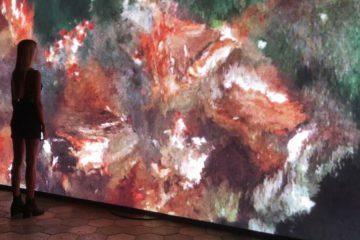 So, in a sense, the aesthetics are not pre-determined but rather are generated through the new combination of the mixed reality the body perform with. 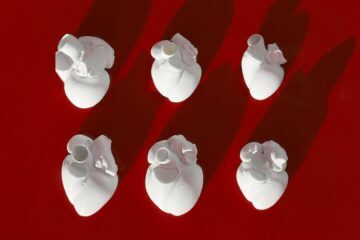 Serena Cangiano: In your artistic research you touched on various topics as for example the medical or biological scientific research, and the one more specifically technological of robotics and of immersive virtual reality. In the development of your projects how much important is the interaction with these discipines? 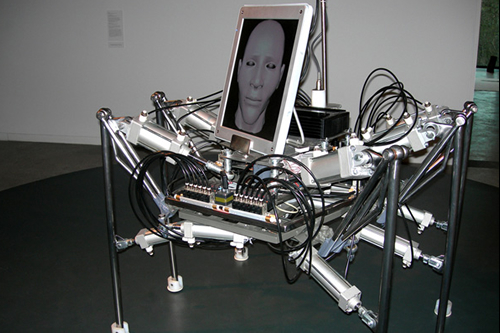 And what do you think about the relationship between art, science and technology in your work? Stelarc: The roles of science and arts are very different both in strategies and in outcomes. I think art is more about asking questions rather than the scientific approach that tries to answers questions. So i think art is interesting when generates more questions than it answers. Art should be an unstable interpretation of the world that opens to further appropriations and further unfolding into unexpected directions. This is not the agenda of science which tends to be somehow more utilitarian and much more methodic in its research approach. 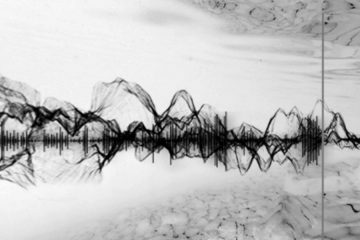 There are of course areas like quantum mechanics where theories depend so much on imaginative evaluations and almost sci-fi speculations about the possibilities of the structure of the universe. But, generally speaking, i think we do not want artists to be doing bad researches and we do not scientists to become bad artists. It’s better if they will stay away from each other. What connect artists and scientist is just technology. But they use technology in different ways. I have to say…when the third hand was first constructed in 1980, I was invited at the Jet Propulsion lab in Pasadena and at the Johnson Space Center in Houston to do presentations to the Extra Vehicular Activity Group because there was an interest in the third hand from a kind of technological sense, but of course my hand was designed as a third hand, so ultimately there were no connection points because it was a work of art and there won’t have been any practical and economical results. 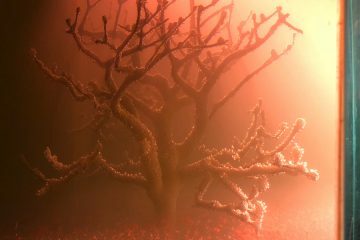 For what concerns the collaborative aspect of my projects with scientist, i think is important as I’m a media artist, but that collaboration is the giving of the expertise or the sharing of expertise to construct a large project that has not a determined outcome. Pierluigi Capucci: In your research you managed to give a forward-looking thought on the body of the future, what is now the body of the present, increased with communicative prostheses of ambient intelligence systems, of mobile telephone systems, of telepresence. Regarding the technological progress of our present how do you see the body of the next future? Stelarc: I think there are some interesting scenarios about the future of the body, most of them generating contestable futures. So, I’m not suggesting some kind of utopian sci-fi futures for the human body, but the human body, for example, unexpectedly has recently become the host for its machines. Increasingly technology has become microminiaturized and it is now being safely inserted inside the body. At a nanotechnology scale, the technology will be able to re-colonize the human body. So, now we are colonized by bacteria and viruses: in the future will be re-colonized by machines, sensors and nanorobots. And this is a quite a plausible scenario. Instead of the Japanese manga, sci-fi external extensions of the body through exoskeletons – that I have done – perhaps the future of the body will be a future with the body itself becomes the host for its machines and all technology of the future will be invisible because will be inside of the body. This is a possible scenario, but there are many others. Marco Mancuso: Contemporary man’s relationship with the new technologies are moving in the opposite direction, step by step, and are becoming more and more intimate, emotional, viral, connective and invasive. Beyond the aesthetic and scientific appeal, the importance of the historic passage from the imaginary cyberpunk to the modern bio art, beyond the natural research and expressive path of an artist, how do you consider the ethic and thinking value of your work in relation with our conjugation with technologies from the last decade to the reality of modern man? 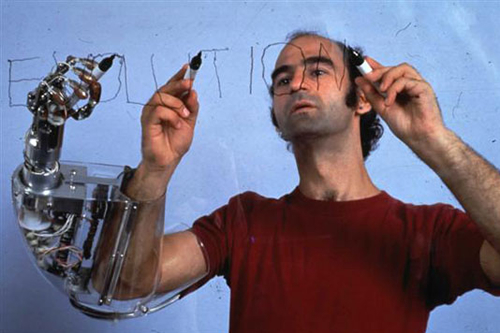 Stelarc: I guess I’m not so interested in mere technicity of operations but rather how this technical instruments and augmentations altered the body operational possibilities. In fact, the more and more performances i do, the less and less I think I have a mind of my own, no any mind at all in a traditional metaphysical sense. In other word, this body that you see is an obsolete body that is empty and perform largely involuntarily, but this emptiness is not an emptiness through a lack but rather an emptiness through an extension and extrusion of the self through technology electronic media and internet. So there is nothing inside in this body, no images, no ideas, nothing. What is important is not what is inside me, but rather what happens between us in the medium of languages we communicate with, in the social institutions we function within, in the culture we have been conditioned. To me, what technology does is expose and empty the body but this empty and obsolete body becomes a better host for alternate and anatomical architectures that are a combination the human the machine and the virtual system. I think is not a matter of thinking of the body as a normal body in its biological kind of presence and proximity and intimacy as opposed to a kind of the technological systems that we perform with because these technological systems we are all using them. We perform, maybe, on the stage amplifying and extending these interactive systems but we all have computers, cell phones, we all function within a technologically warm and information rich environment. I think technology is not a kind of alien other but rather what construct a human civilization, what means to be human, what enable us but simultaneously expose us as an unstable operative systems.